Flooring installers impact longevity, design integrity and the overall success of a project. The difference between INSTALL installation teams and non-INSTALL installation teams is clear when it comes to product selection, job site preparation, scheduling and overall reliable installations. Here’s why. Partnered with every major mill and manufacturer in the floor covering industry, INSTALL contractors are specified, endorsed and recommended by its alliance partners. Contractors work with them to find the best products for each installation. An independent dealer is reliant on working with only the mills and manufacturers within its supply chain. INSTALL contractors employ their installers. They are part of the project from product selection to installation. The sales team ensures that proper floor preparation, moisture reading and mitigation are performed to ensure successful installations. An independent dealer is separate from the sub-contractor installation team. Floor prep is required by the installation team, who rarely sees the site beforehand. Moisture or floor prep issues are major disruptions and are more likely to be overlooked. INSTALL contractors have control and can schedule their installation teams to show up per the needs of the job. Because independent dealers are separate from the sub-contractor installation team, they cannot control scheduling. To maintain autonomy they relinquish control of scheduling. Our installers undergo a four year, industry-endorsed floor covering apprenticeship followed by career-long training and rigorous certification requirements. Floor covering mills and manufacturers specify, endorse and recommend INSTALL installers because the curriculum is developed through collaboration with industry stakeholders. 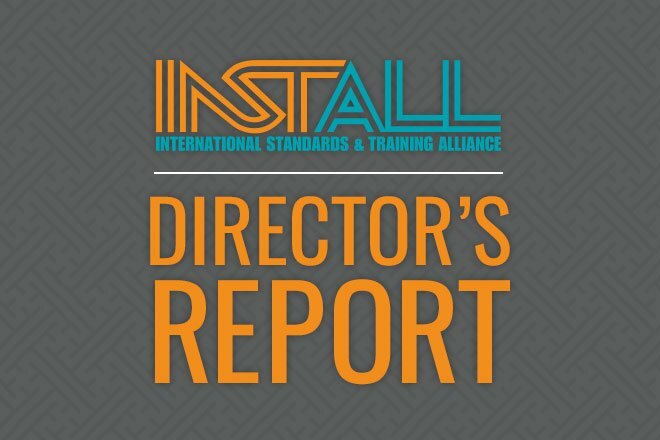 Installers outside of INSTALL have to build their own training program and many do not have the knowledge or resources. Adding to the risk, independent sub-contractors commonly rely on temporary, untrained helpers.